This entry was posted on April 17, 2017 by sharonwynn, in Donations, Uncategorized. Bookmark the permalink. Tray Adam Kemp, 31 of Tallahassee, was peacefully taken into the arms of our Lord early in the morning on April 17, 2017 after a lingering medical condition. Tray was a loving, caring, and a “fun-to-be-around” kind of guy. 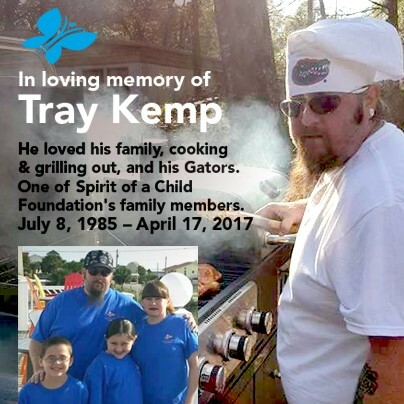 He loved his family, Florida Gators and BBQing. He leaves to continue his legacy, his wonderful daughter, Hailey, his amazing son, Ian, and the love of his life and mother of his world, Brittany Rayburn. He is also survived by his proud parents, Larry and Marie Kemp, brothers Robby Kemp (Aja Kemp) and Dakota Kemp (Casey Bowen); and loving admiring sisters Cheyanne Kemp (Cason Ash), Ashley Kemp (Michael Daniels), and Rachel Williams (Lyle Clanton), Grandparents Mary Kemp, and Oscar and Edna Martin. In addition, survived by nieces Kyra and Alexandria and nephews Dominic, Jayden, Jackson, Dominick and Cameron. Additional survivors include his aunts Debra Gibbs (Barry) and Josie Lane, his uncles Patrick Johnson (Mary) and Oscar Martin Jr., a special cousin Pastor Kyle Johnson, who was more like his brother, additional cousins include Rosie Hill and others, and numerous friends, too many to even keep count. He was preceded in death by his grandfather C.T. Kemp (“Pawpaw”). A celebration of his life and BBQ will be held Saturday April 22, 2017 at the home of his parents in Tallahassee. « 4th Annual Rockin’ with Spirit was a HUGE success!